While Joe's figures are a little inaccurate (see below) he's right to say it's the largest amount of social homes delivered in any development in the past four years, including any council-led schemes. For example, at Heathside & Lethbridge, the council-led "regeneration scheme" at Blackheath Hill/Lewisham Road, the two estates combined originally consisted of 638 flats (527 on social rents and 111 leaseholders). The Council estimated it would cost £29.3m to do a high quality refurbishment (beyond Decent Homes standards) on all the blocks. But instead they chose to partner with Family Mosaic housing association to demolish all the blocks and build 1192 new flats at a cost of £272m. According to figures provided by G15 (the group representing London's largest housing associations), at completion of the phased redevelopment in 2020, only 17% will be 'social rents' (199). 21% (248) will be 'affordable rent', 11% shared ownership/equity, and a whopping 52% (616) will be for private sale. This represents a loss of 328 'social rents' – and decanted tenants take priority on the Council's waiting list, depriving others on the list. “to increase the amount of affordable housing through increased grant funding, to change 43 homes from private sale to London Affordable Rent (social rent) at a cost to the Council of £4,310,211, and 16 homes from private sale to shared ownership at no additional cost”. That's more or less it. But let's go back to Joe's figures. If you add 43 additional London Affordable Rents to the original 61 (74 new builds minus 13 demolished tenanted homes) you get 104, as Joe said. But this is not 54%, it is under 50% (of the total 209 units). And if you add 16 additional ‘shared ownership homes’ to the original 22 (25 new builds minus 3 demolished leaseholder homes), you get 38. 104+38 = 142, which is not a 75% total of affordable housing. It is under 68%. Never mind, it's a great improvement on the previous quota (8% in 2016 and 41% in 2017) and in fact is well over the 50% required by the GLA to grant funding (at around £60k per affordable flat). Trebles all round. In fact, if there's that much subsidy sloshing about and quite a lot of it coming from the Council itself in previously unused Right To Buy receipts as well as selling the land at "less than best consideration" (actually about 25% of what Family Mosaic paid for its site at Sun Wharf), then why it is still necessary to DEMOLISH 16 HOMES and a much needed mature green space, when no one who actually lives here wants that? The residents at Reginald Road certainly don't want it, but does anyone listen to them? They have been living with the threat of demolition since 2008 and have several times petitioned against the demolition of their homes. The latest petition was handed in to Lewisham on April 24th and was signed by 12 out of 15 residents (there are 16 homes, but one is presently empty). 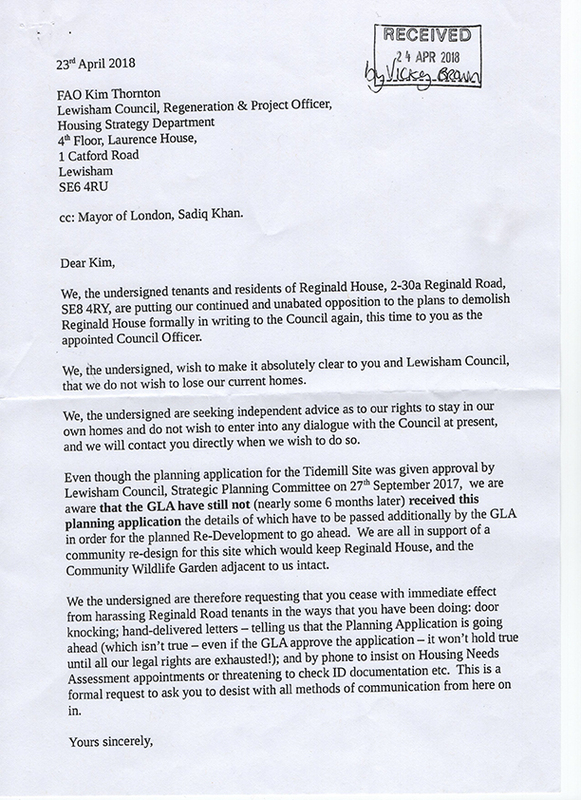 Not only have the residents declared several times that they want to keep their homes, but the plans involve a stock transfer (from Lewisham Homes to a housing association), which by law, requires a ballot. Like Heathside & Lethbridge and others, they have never been offered one. Lewisham get round this by offering tenants rehousing in Council property in other parts of the borough if they don't want to move to a new housing association flat. 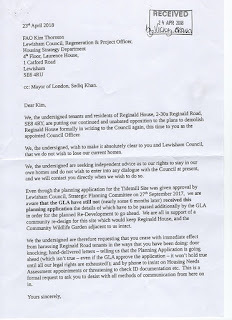 The Mayor of London (along with Lewisham's Mayor-in-waiting) is now proposing mandatory ballots of residents for schemes where any demolition is planned, as a strict condition of any GLA funding. Soon after consultation on the policy began, Sian Berry (London Assembly member for the Green Party) discovered that the Mayor of London had already signed off funding for 34 estates to dodge his own new ballot rules. Unfortunately, Tidemill is on that list because the GLA signed a contract for funding in January, despite not yet having approved the planning application in full. We put in an FOI request to see the officer's report that led to the key decision made on 15th March behind closed doors. The answer is as expected – the Council are not required to oblige the request. This is because they are partnering with private companies – Peabody Housing, Sherrygreen Homes and Mullaley – who are not public bodies. This confidentiality applies to any regeneration scheme where Lewisham partners with housing associations and private builders. Architects for Social Housing (ASH) spent over three years trying to obtain figures from Lambeth Council via FOI when working on alternative community-led plans for the Central Hill Estate in Crystal Palace. They concluded: "The desire of the private sector development partners to hide such information…should be an argument in favour of disclosure in any proposed housing development – let alone one based on the demolition and privatisation of publicly owned assets; let alone one that will receive millions of pounds of public funding…"
Surely £4+m of public money and the sale of public assets to a private company demands full transparency?